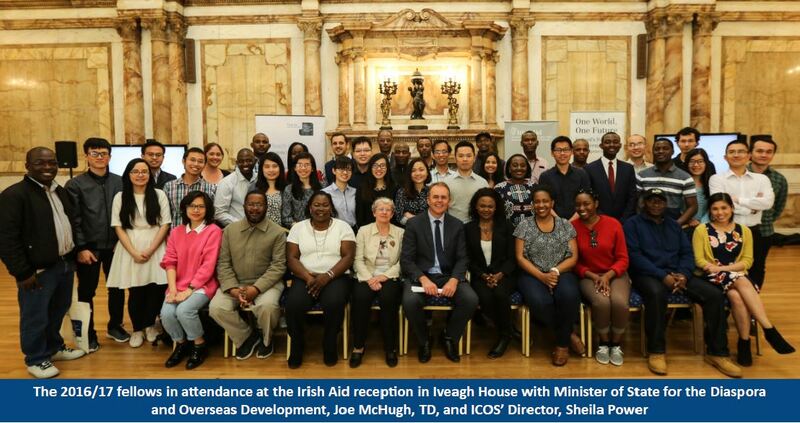 On the evening of May 17th, Minister of State for the Diaspora and Overseas Development, Joe McHugh, and Irish Aid welcomed 40 of this year’s fellows to a reception at Iveagh House, the headquarters of the Department of Foreign Affairs and Trade in Dublin. Minister McHugh spoke at the reception about his time in Kenya and Uganda, and in particular acknowledged Uganda’s efforts in providing refuge to hundreds of thousands of migrants, and the need for European countries to support these efforts. Two of the fellows also spoke: Abdul Koroma from Liberia and Duth Kimsru from Cambodia. Abdul recounted his personal and career journey to date, and spoke poignantly about the years of crisis in Liberia during the outbreak of the Ebola Virus. Abdul also presented some slides with photographs representing his experiences in Ireland. With the formalities completed, Irish Aid and ICOS staff were able to speak to fellows on what was the last formal occasion at which this year’s fellows will meet, and so for many it was an occasion to say goodbye. ICOS and Irish Aid would like to wish all 2016/17 fellows the best of luck in their exams and dissertations in the weeks ahead, and look forward to maintaining connections into the future after they return to their home countries in the coming months.